Saranika Chakraborty's first place poster, which is representing New York State in the National Missing Childrenâ€™s Day Poster Contest sponsored by the U.S. Department of Justice. 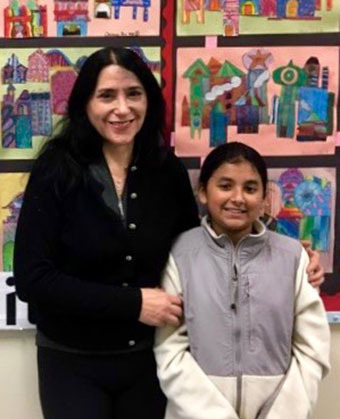 Poster contest winner Saranika Chakraborty and her fifth-grade teacher, Kathleen Izzo. From left to right: Contest judges Ellen DeChiro, an investigator with the special victimâ€™s unit of the New York State Police; Matt Frear, whose teenage brother Craig disappeared from Schenectady County in 2004, and Michael C. Green, executive deputy commissioner of DCJS. 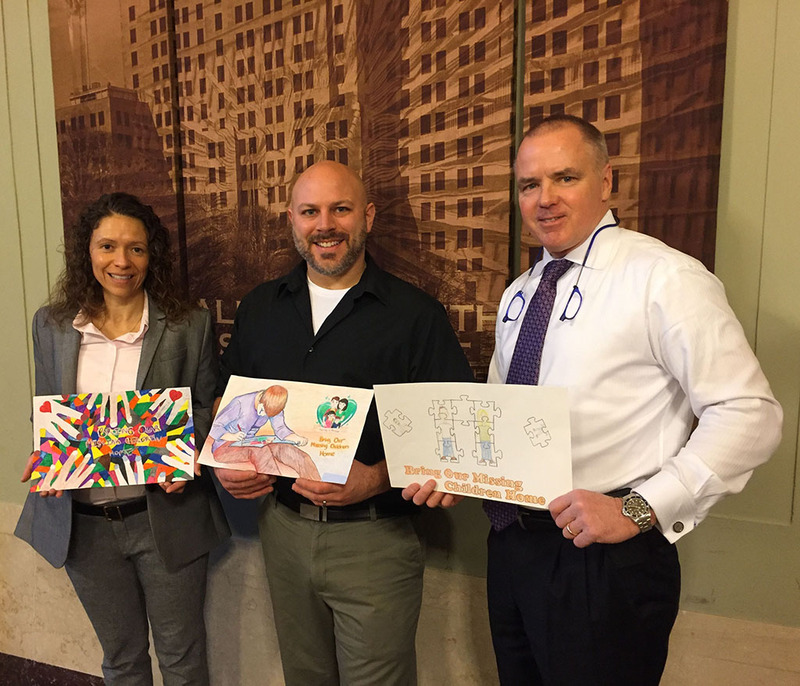 Frear displays the winning poster while Green shows the second-place winner and DeChiro, the third-place winner. 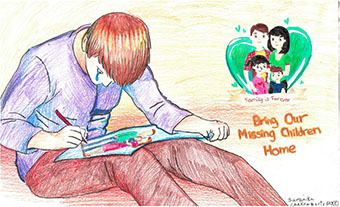 Saranika Chakraborty designed her poster to reflect the aching sorrow a child feels while separated from their family. The entry submitted by the 10-year-old aspiring artist from PS 877 51st Ave Academy in Queens shows a boy with a tear streaming down his cheek as he draws a picture of his family without him. Contrasting this scene is a smaller drawing of a happy family of four with the words, ‘family is forever’ beneath the image. Saranika’s poster was chosen from a record number of entries to represent New York in the National Missing Children’s Day Poster Contest, a competition for fifth-graders sponsored annually by the U.S. Department of Justice. New York and other states annually coordinate their own contests, the winners of which compete against each other in the national competition. The New York State Missing Persons Clearinghouse, which is located at the state Division of Criminal Justice Services (DCJS), sponsored the state’s contest and received 302 entries from 49 school districts across the state. Clearinghouse staff narrowed the entries to the top 60 for review by a panel of three judges, which was unanimous in selecting Saranika’s poster as New York’s winner. Each judge independently selected the poster as the winning entry and assessed the submissions without knowing the students’ names or schools they attend. Judging the entries were DCJS Executive Deputy Commissioner Michael C. Green; Ellen DeChiro, an investigator with the special victim’s unit of the New York State Police; and Matt Frear, whose teenage brother Craig disappeared from Schenectady County in 2004. National judging will occur later this month in Washington, D.C., with the winner of that competition announced in April. The winning poster will be used to promote this year’s National Missing Children’s Day, which is marked annually on May 25. The state and national competitions are designed to raise awareness and educate the public about unresolved missing children cases. May 25 was designated National Missing Children’s Day in 1983. On that date four years earlier, 6-year-old Etan Patz vanished in New York City. The boy’s disappearance gained wide publicity and created a groundswell of attention to the plight of missing children. Last year, a New Jersey man was convicted in connection with the kidnapping and murder of Patz and sentenced to life in prison. Saranika’s winning entry and all other posters submitted to the New York contest will be on display at the Empire State Plaza Concourse in Albany during the week of May 21, to coincide with Missing Children’s Day. New York’s contest also featured second- and third-place winners: Jason Rowe from Elba Central School in Genesee County secured the number two slot and Hannah Hollenbeck from Howard A. Hanlon Elementary School in the Schuyler County town of Odessa, was third. There were 17,114 children reported missing across New York State in 2017, with the vast majority of them reported by police as runaways. The overwhelming majority of these children returned home last year, but more than 2,000 missing children cases remain unresolved. The Missing Persons Clearinghouse assists law enforcement agencies by providing training, case management guidance and investigative support, such as publicizing missing children cases. It also administers the state’s Missing Child Alerts, which are activated when a case involving a missing child under the age of 21 doesn’t meet AMBER Alert criteria. The public is encouraged to receive notifications whenever the Clearinghouse or the New York State Police issue an alert about a missing individual. Both agencies partner with NY-ALERT, which sends out an automatic e-mail or text message to subscribers whenever an AMBER, Missing Child, Missing College Student or Missing Vulnerable Adult alert is activated. To receive these alerts or others, sign up for a NY-ALERT account by visiting www.nyalert.gov. Anyone with an existing NY-ALERT account can add these alerts through their profile.